On March 21 at Worcester State University, early childhood education practitioners from Massachusetts, Connecticut, and Vermont gathered to discuss how to get young children excited about science, technology, engineering, and mathematics (STEM). The third annual event was a collaboration of the Institute and the Massachusetts Head Start grantees. The theme was “Explore, Investigate, Examine, Inquire”. Conference attendees included teachers, home visitors, education supervisors, and directors from Early Head Start and Head Start programs. Exhibitors presented hands-on examples of their classroom of STEM curricula including experiments and activities for exploration. 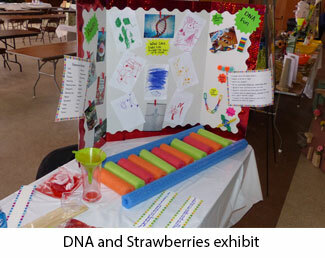 One exhibit, “Extracting DNA from Strawberries” by the Holyoke•Chicopee•Springfield Head Start focused on explaining DNA. Through strawberries, funnels, and the human senses of feel, smell, and taste students learned about how DNA decides the characteristics of living things. There was also a series of presentations about STEM in the classroom by early childhood education practitioners. Communities United Head Start’s presentation underscored how important it was to identify ways to connect STEM with what kids are already excited about. An example shared was talking with students about cartoon superheroes who don’t possess supernatural abilities but rather rely on science and technology for their superpowers like Batman and Ironman. Parent/family engagement was also stressed during the presentations. For example, Communities United Head Start uses some of their space for a “science museum” where past experiments are set up for child and family viewing and interaction. At Worcester Child Development Head Start, the STEAM (STEM + Art) Room is utilized by parents to explore learning activities with their children and to support school readiness skills. All participants were provided with binders of all of the lesson plans for the exhibits. As the day ended, participants were all engaged in lively discussions about how they will take the information back to their programs and use it to build on children’s natural curiosity to explore their environments and learn new things.